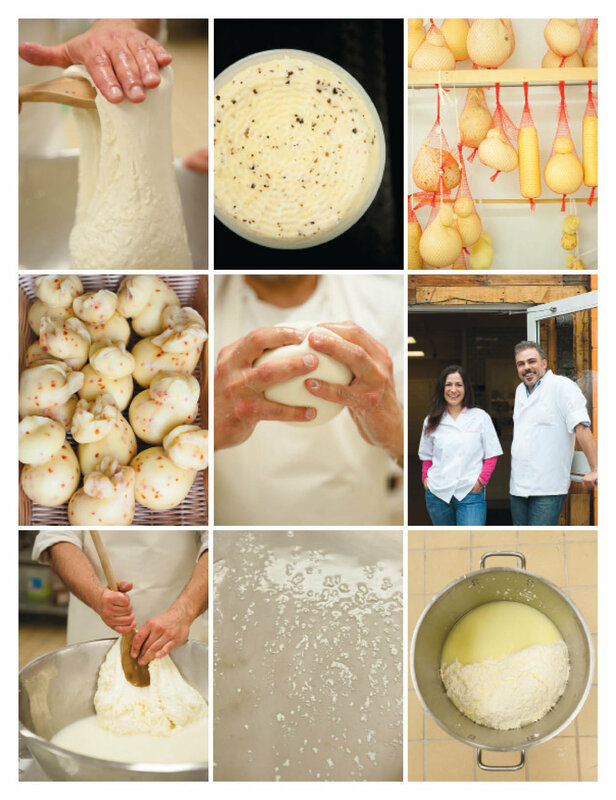 Italian cheese maker Luca Mignogna, 40, says he has been in love with mozzarella “since I was a little kid. It’s kind of like my first girlfriend.” That passion is evident in the artisan’s balletic movements as he stirs curds in a 100-gallon tank, rhythmically dips in and scoops them to a tub, and finally, when the time is just right, pulls and stretches the curds back and forth, over and under, until they come together into a shiny, smooth round of cheese.In a 1,500-hundred square foot room, all glass, gleaming steel and plastic, and food-grade tile, Mignogna makes the cheeses he grew up with in southern Italy—mozzarella, ricotta, primo sale (a kind of farmer’s cheese)—and some others that are less familiar to American palates, like scamorza and caciocavallo (literally, cheese on horseback). The environment at Wolf Meadow Farm in Amesbury, however, could not be more different from the barn in Campobasso where he used to watch his grandfather make them. In fact, “farm” is a bit of a misnomer, as the facility, with a retail space in front of the cheese-making area, is set in a nondescript industrial area that is anything but bucolic. The name, Mignogna says, comes from his family nickname and the animal about which he is passionate; and the company logo is meant to evoke his hometown. Mignogna, who came to the United States in 2003, began making cheese about a decade ago when he was living in California and managing restaurants. He bought some raw milk in a natural foods market and began to experiment at home. He brought his early samples into a restaurant where he was working and people liked them so much they began asking for more. Eventually, he says, he started to think about making cheese as more than a hobby. In 2008, Mignogna moved east, planning to buy a farm. He entered the cheese-making program at the University of Vermont’s Institute for Artisan Cheese, where he learned the science behind what he had been told to do when he was young, and what he was doing instinctively on his own. “This is a beautiful chemistry that has been in place for hundreds of years,” he says of his craft. Every other day, the cheese maker buys raw milk from Artichoke Dairy, in neighboring Newbury. He says his relationship with the dairy and its owner Bruce Colby is key to his business. In fact, he chose his location in large part for its proximity to the dairy. Being close to “the ladies,” as the cows are called, allows him to use the freshest milk possible. “In less than 10 hours we can have cheese on your dish that was in the cow in the form of milk,” he says. And he feels that the positive energy in the barn, and the way “the ladies” are treated, “in the most natural possible way” positively affect the quality of their milk. When he gets back with the milk, Mignogna pasteurizes it and divides it into three batches, one for primo sale, one for scamorza, and one for mozzarella. Primo sale means ‘first salt’ in Italian and this is the first product to come out of the cheese-making process. After it is cooked, the milk is coagulated. The whey is strained out and the curds are cooked with water and salt. Then Mignogna—and Truitt, when he’s there—scoop the curds into molds, where they cool to room temperature. The cheese makers stir truffles and red peppers into some batches; others are kept plain. The final product is soft and fresh, similar to farmers’ cheese. “The nice thing is, every time is different,” Mignogna says, holding up a spoon full of warm curds that smells buttery and delicious. “We do the same things but never in a mechanical way.” Despite the science, much of what he does is instinctive. He knows when the curds are ready to stretch by the way they look and feel. They have to be shiny and have a certain degree of elasticity. And nothing can be rushed. Curds are ready “when they’re ready.” Though what constitutes ready for one cheese is not necessarily the same for another. Caciocavallo is a specialty cheese that is rarely sold in the US and is increasingly difficult to find even in Italy. It has to be made by hand and each one takes about 20 minutes to shape. For this reason, making it is not at all cost-effective. Breaking into a grin, Mignogna notes, “But I don’t get paid, so I can do it.” Spreading curds in a tub, Mignogna sprinkles them with salt, then tosses it all around with a big wooden spoon and paddle. He pours in water then draws the distant curds toward the edge of the tub closest to him. Working in a crisscross motion, he pulls and stretches with the wooden tools, rhythmically. The process is not entirely unlike kneading dough, but he is not using his hands. Soon, the separate curds are one sleek, shiny piece. Then the cheese maker begins to pinch and pull and stretch it out by hand. “It never gets old,” murmurs Barbieri, who has been watching, rapt. Mignogna folds the cheese over, stretches, and forces air out, finally squeezing a small round at the end as if he’s strangling it, to form the little horseback rider, and ties it off with a string. Mignogna is in constant motion but never appears rushed. There are different cheeses in different stages of production in different vats at any given time, and he pops between them pulling up curds and whey to check their development, washing down the floor with huge waves of water in between. It is important to Mignogna that his business be as sustainable as possible, a philosophy he shares with Artichoke Dairy’s Colby. RiverWalk Brewing, in nearby Newburyport, gives leftover mash to Colby, who feeds it to his cows. Mignogna buys their milk, and sends his leftover whey to the pigs at Green Meadows Farm in South Hamilton. Between these operations, “there is no byproduct waste,” he says. In addition to saving gas by situating his business so close to his source of milk, Mignogna uses compostable bags in the store and brings cheese to farmers markets in compostable plastic containers. “These little tiny things keep us working in the direction that we believe is the right one,” the cheese maker says. This will be Wolf Meadow’s first summer in its Amesbury space. Mignogna designed it, using reclaimed wood from shipping pallets for some of the walls in the retail space and dry room, and ceiling tiles from the original kitchen area that he and Barbieri turned over and mounted on other walls. This focus on reusing materials is borne of the sustainable lifestyle that was all Mignogna knew growing up and is determined to maintain. “I try to recreate the feeling of being in Italy,” he says in his mellifluous accent. With these beautiful and delicious cheeses, he gives us an authentic taste of the country.